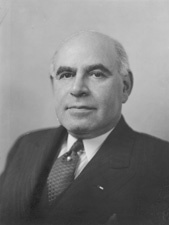 LEHMAN, Herbert Henry, a Senator from New York; born in New York City, March 28, 1878; attended Sachs Collegiate Institute in New York City; graduated from Williams College, Williamstown, Mass., in 1899; employed by the J. Spencer Turner Co., textile manufacturers; in 1908 became partner in Lehman Bros., investment bankers in New York City; during the First World War was commissioned a captain in the United States Army in August 1917, later attained the rank of colonel on the General Staff, and served until April 1919; lieutenant governor of New York 1929-1932; Governor 1933-1942; Director of Foreign Relief and Rehabilitation Operations in the State Department, Washington, D.C., 1943; Director General of the United Nations Relief and Rehabilitation Administration 1943-1946; unsuccessful candidate for election to the United States Senate in 1946; member of Public Advisory Board of the Economic Cooperation Administration 1948; elected on November 8, 1949, as a Democrat to the United States Senate to fill the vacancy caused by the resignation of Robert F. Wagner; reelected in 1950 and served from November 9, 1949, until January 3, 1957; was not a candidate for renomination in 1956; was a resident of New York City until his death there on December 5, 1963; interment in Kensico Cemetery, Valhalla, N.Y.; posthumously awarded the Presidential Medal of Freedom on January 28, 1964. Dictionary of American Biography; Ingalls, Robert. Herbert H. Lehman and New Yorks Little New Deal. New York: New York University Press, 1975; Nevins, Allan. Herbert H. Lehman and His Era. New York: Scribner, 1963.